The eight teams left in the 2013 U16 European Championship are also still in the battle for the five places reserved for the FIBA Europe zone in the 2014 FIBA U17 World Championship for Women. The Slovak Republic as hosts for the World Championship have automatically qualified. The winners from the quarter-finals automatically qualify for next year's World Championship. The fifth spot goes to the winner of the 5th-6th place classification game. For the eight other teams, the third phase of the competition, the 9th-16th classification round is also a knock-out competition with the teams finishing in 14th, 15th and 16th place being relegated to Division B for the 2014 U16 European Championship. Spain maintained their unbeaten record with a (68-61) victory against Russia. Spain looked comfortable during the first 12 minutes and led (22-11). However an immediate 9-0 run by Russia changed things and the match became more intense. During the first 28 minutes of the game there were a total of 8 lead changes and 4 ties. Spain were then able to pull away slightly to record another impressive victory. 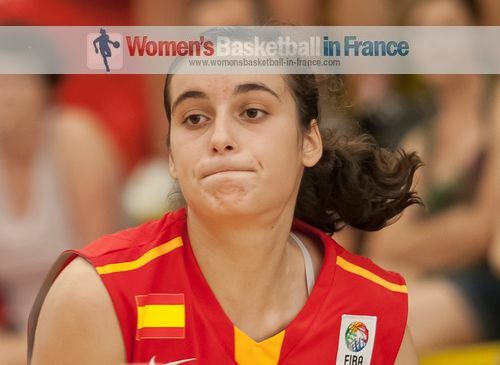 Angela Salvadores (in picture) was again the driving force for Spain with 21 points while Elena Shataeva and Maria Vadeeva (13 rebounds) knocked down 14 and 13 points for Russia. Croatia went on a three-point shooting festival, knocking down 10 shots from long range as they beat Turkey (66-59). Leading (25-14) by the end of the first quarter, Croatia were able to stay in front throughout. Iva Slonjsak (5 assists) and Ivana Dojkic (6 steals) did most of the offensive damage with 26 and 15 points each for the winners. For Turkey Inci Güclü - who is just 14 years old but 2 meters tall - had her best game of the European Championship with 13 rebounds and 7 points. Latvia were involved in a tight game with Greece and just edged the game (56-55). The match itself counted for nothing because Latvia had qualified for 4th place in their group before the game started and Greece had been eliminated on day 5. The the other highlight videos from day 6 can be found on the right menu. The Czech Republic went in front for good with their first basket two minutes into the game (2-1). Belgium battled away bravely. But they gave up too many offensive rebounds (29) to trouble their opponents. Karolina Fadrhonsova knocked down a three-pointer from mid court to close the first half for the Czech Republic (32-23). Julia Reisingerová played for just 18 minutes but still finished the game as the top scorer with 14 points as the Czech Republic strolled to a (73-43) victory to gain first place in Group F.
France once again made their coach sweat, leading (46-36) with six minutes to play against the Netherlands, they failed to score again. The Netherlands came right back into the game and almost snatched the win at the end with a three-point attempt by Janis Ndiba. France survived to win (46-44) with another double-double performance by Ornella Bankole who scored 17 points and pulled down 10 rebounds. For the Netherlands Laura Westerik had a game high 21 points. Hungary outscored Italy in the final eight minutes 19-3 to blow open a tight game to win (60-44). It all went wrong for Italy once Francesca Pan fouled out with 6 1/2 minutes to play. In Group G the Slovak Republic beat Lithuania (69-59) and claim first place in their group. Sweden did not have any problems in defeating the hosts Bulgaria (77-38). The Slovak Republic, Lithuania and Sweden finished with two wins and one loss each and the points difference was used to place them for the 9th-16th place draw. Bulgaria are the only team in this competition without a victory.